Most folks realize that international commerce delivers a steady stream of new pests on our shores. You probably also realize by now that I rarely deliver good news. 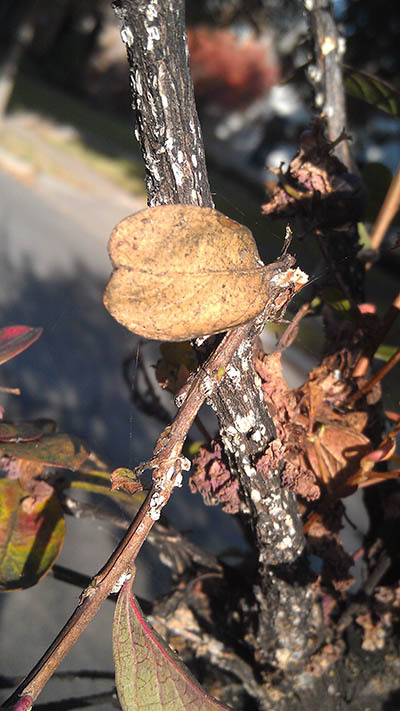 One of the newest pests to plague urban trees is the Crape myrtle bark scale, Eriococcus lagerstroemia. It is not yet in North Carolina but it is probably coming. The first detection of Crape myrtle bark scale in the US was just outside Dallas, Texas in 2004. Since then it has spread throughout much of Texas. It has also spread to Arkansas, Louisiana, Oklahoma, and Tennessee. This is a worrisome development because the climate of Tennessee is similar to many parts of North Carolina suggesting this pest is not limited to warmer areas of the South. Just last week it was found in Georgia. Female scales produce fluffy white filaments that cover their body. In spring they produce eggs beneath their body then die. Tiny crawlers hatch from the eggs, settle in their new spot, and begin producing white filaments. They have at least 2 overlapping generations in Arkansas and probably more in warmer areas. At low density, crape myrtle bark scale feeds in rough areas around branch collars but as the population increases all the bark may be covered. These scales are most often noticed because trees become covered in black sooty mold. At first many people assume this is from crape myrtle aphids so the scales may go undetected. If you notice unusually heavy honeydew and sooty mold on crape myrtles take a closer look at the bark. Since this is such a new pest in the US we do not have a good idea how to manage it. Drench applications of neonicotinoids have provided some control in Texas. However, since crape myrtles flower continually and attract a slew of pollinators this may not be the best option. Insect growth regulators such as pyriproxyfen and buprofezin are effective for many other scales and may be a good option. Horticultural oil, especially the heavier dormant rate, can reduce scale abundance also. But control is not our biggest concern in North Carolina. We should be most concerned about this pest getting into our nurseries and landscapes to begin with. Sedentary pests like this often spread on infested nursery stock or when someone moves here and brings a sentimental plant along with them. We just analyzed the Raleigh street tree database and found that crape myrtles are the most common tree. When I was in Dallas last fall the crape myrtle trees lining streets of downtown and tony residential neighborhoods looked terrible. They were black and crusted with scales. Stumps indicated that many had already been removed. So what is my message for North Carolina urban forests? First, this is another great reason to buy locally. So far you can be pretty sure crape myrtles from North Carolina will be scale free. The larger message is that it may be time to stop planting so many crape myrtles. Each one you plant is likely, at some point, to require extensive (and expensive) pest management. Diversify.